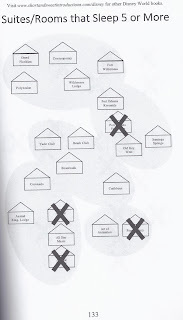 There are a wide variety of books written about Walt Disney, Disneyland, and Walt Disney World. You can find fact filled biographies, historical explanations of how the theme parks came to be, secret revealing books, and books that help you plan your next Disney World Vacation. 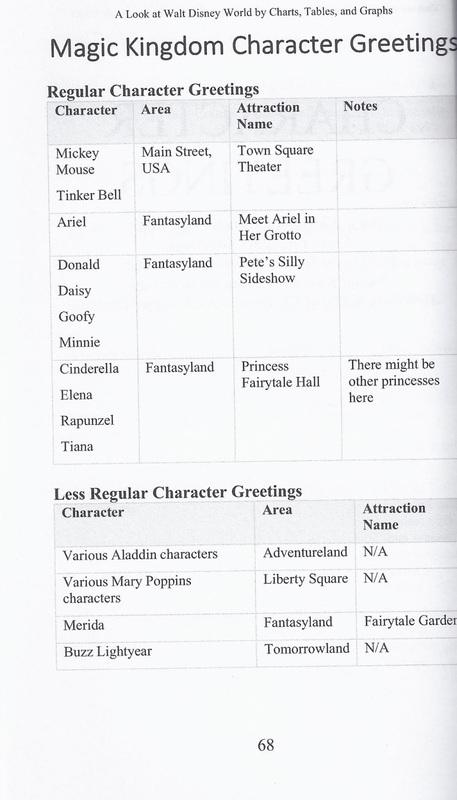 Today we are going to review a new book that takes a novel approach to describing the Walt Disney World Resort and all that vacation goers can discover during their visits. 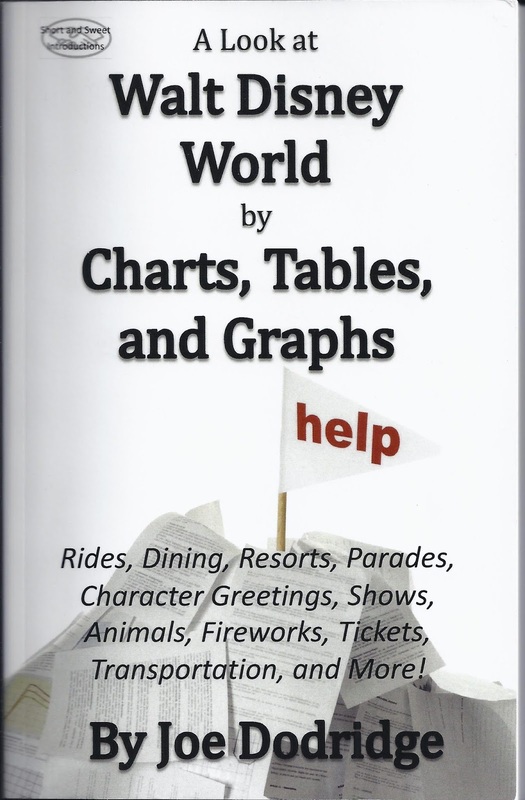 It is titled: A Look at Walt Disney World by Charts, Tables, and Graphs and written by Joe Dodridge. 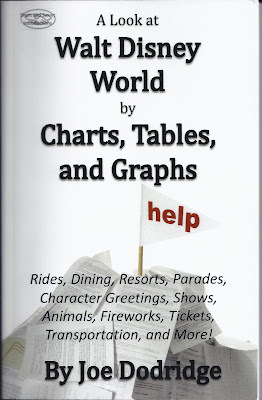 As the name implies, this book is taking a different spin on the vacation planning guide by exclusively using Charts, Tables, and Graphs to share facts and provide insight regarding Disney World. 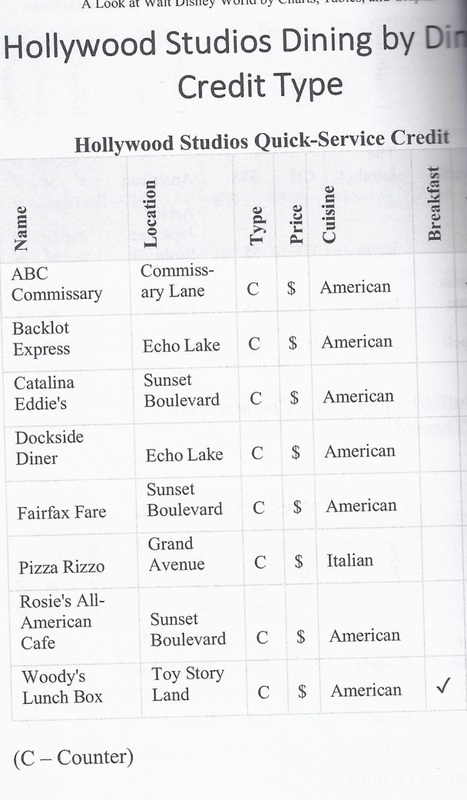 The Table of Contents is needed to find a particular area of interest. Like other guides it is not necessary to follow the book cover to cover, you can easily skip around to areas of interest and discover information in whatever sequence interests you. We found the strongest sections to be Dining and Resorts with interesting facts presented differently than we had seen anywhere else before. 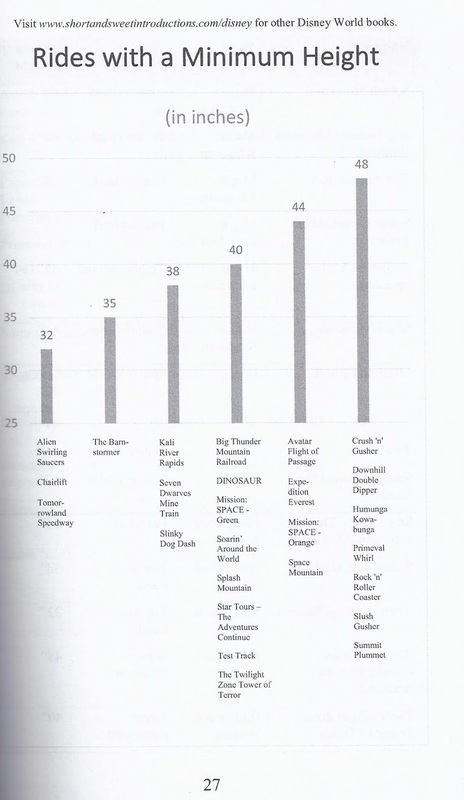 Let's take a look and some of the Charts, Tables, and Graphs that we found the most interesting in this 200 page book. 41 different categories in all presented in this format. For us this was the highlight of the book presenting all of these interesting (and useful) categories in a fun, easy to understand format. There were a few graphs presented like the one above that shows "Rides with a Minimum Height." Overall there were not a ton of graphs and most were pretty basic. They did not capture our interest as much as the Resort Charts. 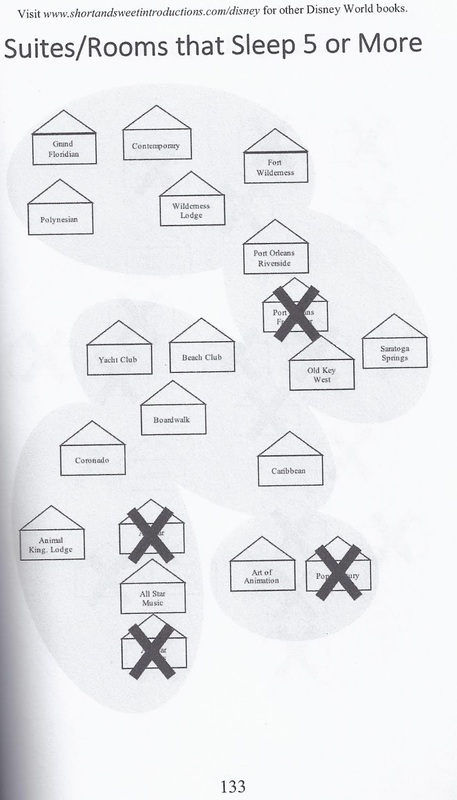 A helpful look at types of Dining & Lounges/Bars existed at Walt Disney World Resort hotels. 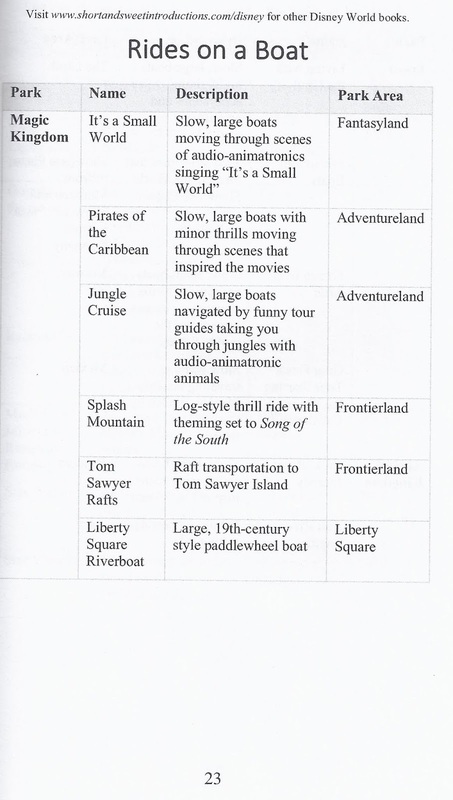 A breakdown by theme park for the unusual category of "Rides on a Boat." 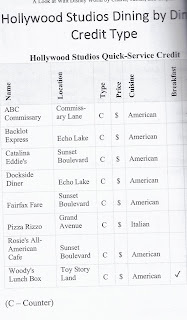 A table listing Dining Options within each Disney World theme park. 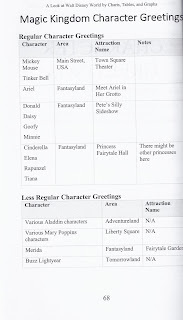 Characters that can typically be found in each theme park. 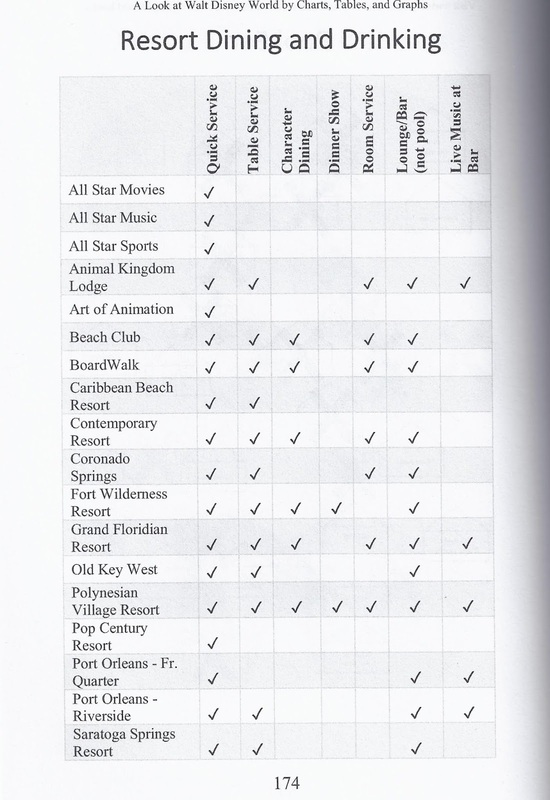 A Look at Walt Disney World by Charts, Tables, and Graphs provides a unique look at Disney World that differentiates itself from the "typical." Our honest assessment is that there are parts that we really liked and parts that were not as interesting. The Resort Section was excellent and held our interest with a unique way to compare and contrast their features. If that same approach was used throughout this could have been a much more engaging book. As it stands this book is still worth checking out and the fact that it takes a different approach makes it worthwhile. It also helps that it is designed so that you can skip around to the areas of interest and do not need to read cover to cover to get use or enjoyment out of the book. 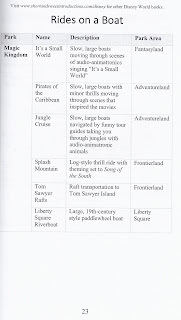 This is the type of book that whether you are a first time Disney World visitor or an Annual Passholder you can find something useful that you may not have been aware of or did not have the information in a handy format. Our other comment is that the graphics are all black and white and not the most engaging. 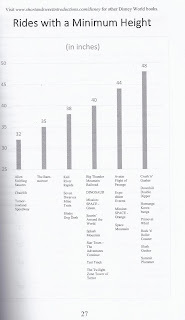 Our scanned copies of some of the charts and graphs illustrate that. You can find this book by Joe Dodridge on Amazon.com to pick up a copy for yourself. If you have read this book feel free to add your review in the comments. 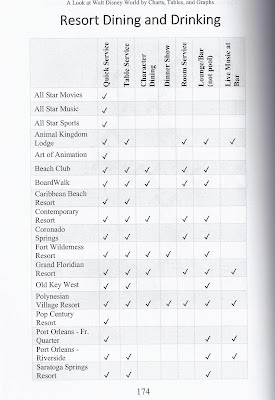 0 comments to "Book Review: A Look at Walt Disney World by Charts, Tables, and Graphs by Joe Dodridge"